OSAKA, Japan, July 20, 2010 (AFP) - Japan's football chief said Tuesday he felt FIFA inspectors had gained a "considerable understanding" of the country's bid to host the 2022 World Cup, including its promise of global 3-D broadcasts. The Japanese bidders gave a three-hour presentation on the World Cup plans to a globetrotting five-member inspection team from the sport's world governing body. 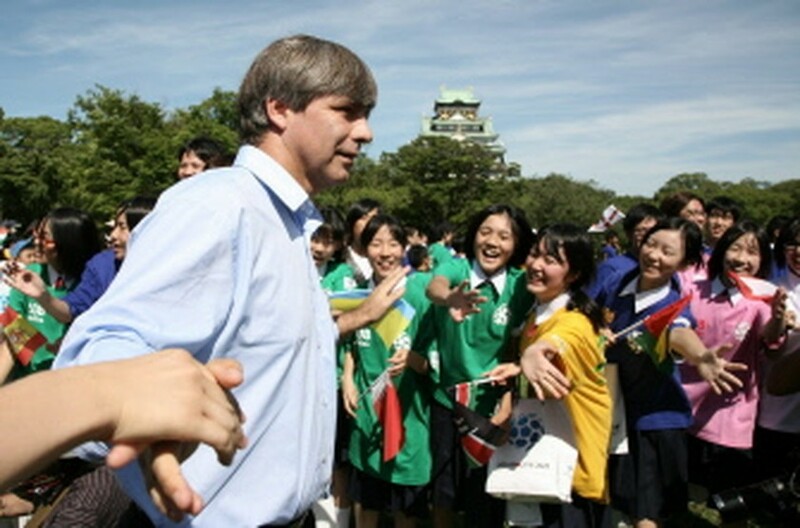 The team, led by Chilean Football Federation president Harold Mayne-Nicholls, arrived Monday on a four-day visit to Japan, the first leg of a two-month tour of nine candidates vying to host the 2018 and 2022 World Cups. FIFA's 24 executives will choose the 2018 and 2022 World Cup hosts on December 2 in Zurich. "I could feel that all of the five people have read our bid book well and have a considerable understanding of Japan's concept," Japan Football Association president Motoaki Inukai told a news conference. He heads the bid committee for Japan, which co-hosted the 2002 World Cup with South Korea. In its bid book submitted to FIFA in May, Japan promised to treat football fans worldwide to ultra-realistic live three-dimensional broadcasts of matches. Under the six-billion-dollar "Universal Fan Fest" project, matches would be viewed in 3-D by 360 million people at nearly 400 select stadiums in FIFA's 208 member countries. The games would be shown on giant screens at the stadiums or -- if technological advances allow -- even projected like a real match onto the pitch itself. The FIFA team was also briefed on construction of a 83,000-seat stadium in Osaka, tentatively named Osaka Ecology Stadium, which would host the opening match and final and operate on solar power. Immediately after their arrival in Osaka Monday, the team used a helicopter to see the site, a former railway yard near the central station which has been redeveloped into a commercial centre. Osaka mayor Kunio Hiramatsu said: "I have explained that the stadium will be built in the middle of where 2.5 million people move every day. It was a meaningful presentation." The inspection team moves on to Tokyo on Wednesday to see a stadium in suburban Saitama which is the potential site for a World Cup draw. After Japan, the team will go on to South Korea, Australia, joint bidders the Netherlands and Belgium, Russia, England, Spain-Portugal, the United States and Qatar. Japan, South Korea, Australia and Qatar have submitted bids for 2022 only, while the others are seeking to host 2018 or 2022.